What’s the first thing you think of when you hear that someone has a blog? You probably think that it’s their own little corner on the internet where that person shares their perspective on life or what they saw at the movies last week. Well, you’re right – a blog is generally an online diary for most people, including myself. Blogs are a way to share personal stories or useful information based on what that particular blogger feel like writing for the day. In short, bloggers write what they want to write. I personally love lists, and I write them as well. Lists are just another way of sharing information… so what’s wrong with that? In fact, I think lists are easier to read at times, especially when I’m reading a blog from my iPhone. And second of all, if you don’t like what a blogger writes… don’t read it. They’re not going to be offended, or at least I know I won’t be. I don’t read blogs about politics or cooking (I mean, I should read the cookings blogs, I might learn something), but I’m not interested in politics. That doesn’t mean I hate bloggers who write about politics. That just happens to be a topic their interested in, so they write about it. I applaud them for that. When I opened up my space here on the Internet it was so I could write what I love writing about. Of course it’s nice to write a post that draws in a ton of readers, but if I write a post that the majority of people aren’t too crazy about, then that’s okay too. 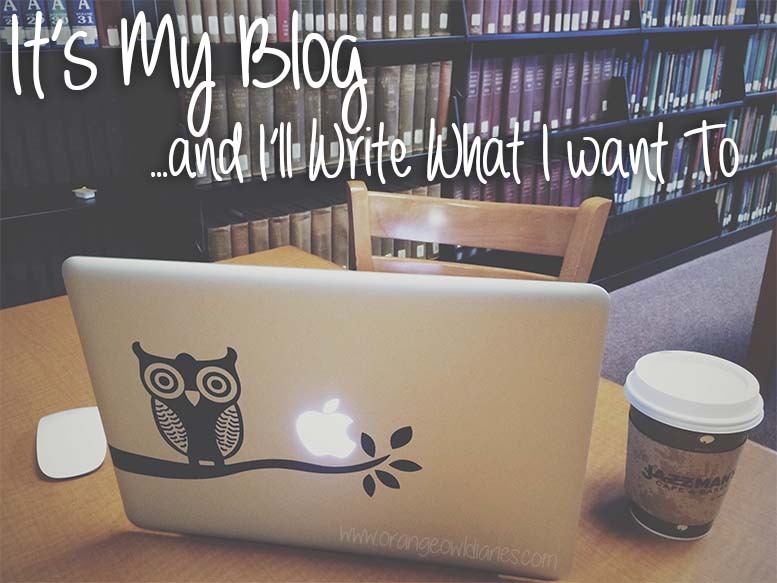 What’s the point in having a blog if you only write to please others instead of yourself? Love this. people are always criticizing….I think the best writing comes from one’s passionate opinion! thank you for sharing! I’m glad I’m not the only one who feels this way. I think there’s an audience for everyone and hope bloggers continue to write what makes them happy. Great post! I’m sure all, or at least most, bloggers feel this way! Thanks for reading and commenting! Frankly, if you’re not writing about what you want to write about, what’s the point to blogging? I’ve tried to stick with specific topics just for the sake of doing so, but if my passion about that topic was gone, it just came across as half-hearted. Exactly. I’ve also tried doing that and it just didn’t work for me. I would even dread writing my next post because I just wasn’t into it anymore.